Spinach and Wine: Paleo Pancit WOW who needs rice??? I made this for dinner last night, it was a HUGE hit! The only thing I would do differently is buy a larger head of cabbage and tone down the quantity of meat used! I cannot wait to adapt this recipe to some of my other favorite Asian foods, you HAVE to make this, Paleo or not its DELICIOUS. 3.Thinly slice green onions, save some for garnish if you like. Add to bowl with other veg. 5. Add Soy or Tamari and let sit for 1/2 hour, I added about 5 cloves of crushed garlic as well but that is not necessary, we just LOVE garlic. Ginger is good to add here too if you have it. 8.Add pork and chicken, stir fry for 5 min. or until cooked. 10. 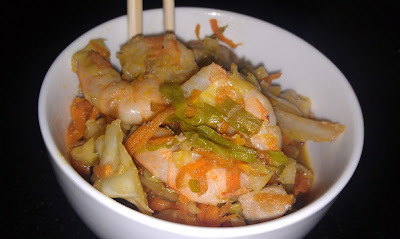 Add cabbage, carrots and onions to wok with fish sauce, fry at high temp for aprox. 8 minutes or until cabbage is cooked but not mushy. I think I overcooked mine but it was still good, cabbage is a very forgiving veg. 12. Add pork and chicken, stir fry for a few minutes and its DONE!!! I did add some crushed red pepper for a little heat, it is totally no necessary but we like our spicy food around here! :) I hope you try it, we LOVED it..